Any future negotiations with North Korea will need to consider the role of economic incentives and rewards for making progress in meeting US goals of reducing Pyongyang’s nuclear weapons capabilities and risk of proliferation. This will require shaping a nuanced balance between the role of measures to maintain pressure to negotiate versus incentives and rewards that are meaningful to the North Koreans and have traction in the negotiations process. Changes in North Korea’s economic circumstances, external relations environment and domestic political context in recent years need to be taken into account when designing a strategy that relates to current North Korean leadership interests and challenges. Doing so will increase the chances of new negotiations being more successful in meeting US goals than previous efforts. This paper explores considerations for selecting positive inducements that will support a negotiation strategy that leads to a sustainable political solution to North Korea’s nuclear threats and that will position North Korea to pursue its economic future in ways that are compatible with reduced isolation and increased integration with the international community. 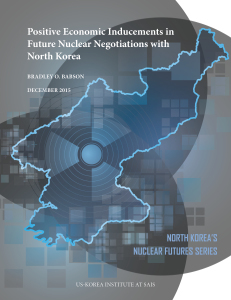 Download the report, “Positive Economic Inducements in Future Nuclear Negotiations with North Korea” by Bradley O. Babson. Find other papers in the North Korea’s Nuclear Futures Series.